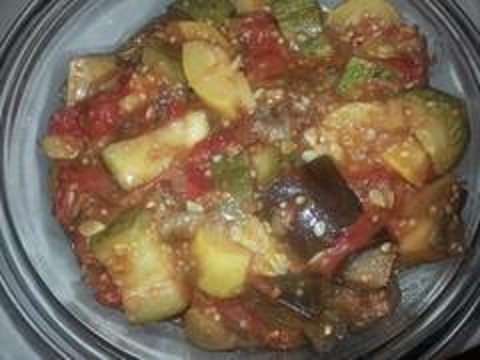 One of my favorite dishes to have in the refrigerator is ratatouille. It's a combination of eggplant, zucchini, yellow squash, tomato, and onion. It's one of my feel good comfort foods, is simple to make and tastes delicious. You'll find lots of recipes out there but this is my favorite one. When it finishes cooking eat or save in the refrigerator for your next meal. my favorite is to heat up a bowl of the ratatouille in a small pan and then pour it over a 1/2 cup of ricotta cheese and have this for my breakfast or lunch. For dinner I usually just have it plain with whatever protein I cook that night. Ratatouille is a great addition to you menu. It's filled with fiber, minerals and makes everything taste yummy. Enjoy.